Posted January 18, 2018 by Jamie Apps & filed under Arts & Entertainment, CD Reviews, Music. Aside from the final two tracks on Revival one gets the sense that Eminem went into the studio to record this record without a clear direction and point he wanted to convey. This lack of direction manifests itself both in the lyrical content and the underlying beats. Throughout the record the beats are simple and safe, whilst the attempts to incorporate classic rock samples into the occasional track is handled clumsily and lazily which severely hamstrings the effectiveness. At 19 tracks long this record drags on far too long, although the final two tracks are a nice payoff for those that can endure throughout the entire record. Castle in particular is compelling due to it’s concept, the track is written as three short letters to Eminem’s daughter Hailie. 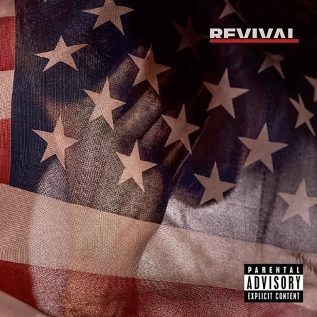 The collaborations with Ed Sheeran, Alicia Keys, Beyonce and Skylar Grey are the highlights of Revival which speaks volumes for Eminem’s lack of impact with this record. Unfortunately this is yet another overly long, lacklustre offering from Eminem and easily worth skipping.